The Provost's Office is pleased to announce recipients of the 2016 round of Provost Research Awards. Any Brandeis faculty or staff member involved in research, scholarship, or creative activity in any field may apply for an award. Proposals awarded funding initiate innovative scholarly inquiry and creative activities that have the potential for significant, sustained impact. Racialization of sexuality and of sexual violence has a long history in the U.S., especially during the eras of legal slavery and Jim Crow. These legacies live on in, e.g., the criminal justice system and in popular culture consumed by students that contains harmful racial-sexual stereotypes. We investigate, via at least three focus groups and student researchers' participant observation (with IRB approval) how sexual harassment and sexual violence against black college students who identify as female might intersect with experiences of racial harassment or racial violence. Studies suggest that global warming may increase the risk of illness and death through the spread of disease. That is exacerbated by the unprecedented levels of international trade and travel that exist today. Already, we are seeing diseases that are typically found only in the tropics spreading globally – due both to the rise in global temperature and to the ease of transport of disease vectors through trade. What are not well understood are the costs and consequences of these increased health risks on economic outcomes. A better understanding of such effects may help guide the development of policy to mitigate their adverse consequences. I propose to study the economic cost associated with the Spanish Influenza of 1918-1919. Language lies at the heart of human identity, culture, and worldview. Understanding language acquisition requires data not only on linguistic structures used, but also on language practices, linguistic self-expression, and worldview of the speakers. I propose to collect ethnographic data on language use in bilingual Russian families in the U.S., Canada, and Germany, and in monolingual Russian families in Russia. These data will be analyzed and integrated into the BiRCh corpus (Corpus of Bilingual Russian Child speech), currently under construction. BiRCh will be the first annotated corpus involving language variation and change that result from interrupted language acquisition, bilingualism, and language attrition. This resource will fill an urgent need in the fields of bilingualism and heritage language linguistics as it will allow linguists to analyze the developmental trajectories in natural language acquisition with various amount of input a child receives. However, like every other such corpus, BiRCh currently has almost no contextual information: it does not situate the recorded speech within the larger context of linguistic practices, values, and aspirations of the participating families. My research will bridge the existing gap between humanistic and structural approaches to language study by combining an in-depth sociolinguistic research with detailed information about linguistic features. My project is a history of the refugee camps of the Civil War. Called “contraband” camps because black refugees were considered the confiscated property of Confederates, the camps became pivotal meeting grounds for emancipation. I give special attention to the religious transformations that occurred in the camps, arguing that these meeting grounds were sites of revolutionary revival. Reenvisioning emancipation as a religious event poses a challenge to our current historiographical conceptions of liberal citizenship. In Civil War historiography, it has been the scholarly concern over black citizenship that has obscured study of radical religious practice in these camps. This project corrects that misconception. Capitalizing on my past research and teaching (Russian history and IGS), I have contracted to write a history of Russia and globalization from 1750: Russia: From European to Global Power. Many general histories of Russia exist, including my Oxford volume, but these are “national histories” and fundamentally “internalist,” with only marginal attention to the transnational that became became dominant over the last two centuries. Indeed, at the very time “national histories” became so popular (and useful in shaping national consciousness and identity), the transnational—FDI, immigration, technology flow, communications, and countless other spheres—nullified national boundaries. Thus far the globalist perspective has only made modest inroads on the traditional national narrative. Most important, my Russia and Globalization will provide a new model of “transnational national history,” going beyond the traditional internalist model (which at best adds comparative data) to show the growing interactive dynamics. A spin-off is a new course (2017-18) on the “history of globalization” since 1500 (covering globalizations I, II, III and de-globalizations I and II). For people with moderate-to-severe chronic consequences following acquired brain injury (ABI) living in community-based supported residences, the quality of their relationships impacts their quality of life, functioning, and ability to reintegrate into the community, while improving job satisfaction and reducing turnover for direct care staff. The quality of relationships in relationship-centered care is captured by the construct of relational coordination, coordinating work through shared goals, shared knowledge and mutual respect (Suchman, 2006; Gittell, 2002). ABI includes traumatic brain injury (from a blow or jolt), stroke, brain tumor, and/or anoxia (oxygen deprivation). The purpose of this mixed methods study is to identify and pilot-test low-cost interventions (by direct care and study staff teams) to improve relational coordination in Massachusetts’ group homes serving people with ABI supported by state and federal funding. The Missing Link: Do Group Biases in Neural Resonance Contribute to Awkward and Ineffective Cross-Group Interactions? Diversity and opportunities for intergroup-interactions are often celebrated as means to reduce group biases and to improve institutional climate and success, but diversity initiatives often are ineffective in part because interracial contact can be difficult and stressful (Richeson & Shelton, 2007). We aim to investigate neural and behavioral processes that might hamper the effectiveness of cross-group interactions in regards to the immediate interaction goals and attitude change. My previous work shows a group bias in neural resonance – similar neural activation during the experience and the observation of actions and affective states, such that we resonate with ingroup members, but not with outgroup members (Gutsell & Inzlicht, 2010 and 2012). The proposed study will be the first to investigate these group biases within an electroencephalography (EEG) hyperscanning design, measuring brain activity of two individuals simultaneously as they are engaged in naturalistic interactions. Working with teams of students, Klausen began in 2006 to develop a database of Western nationals who were associated with terrorist plots related to Al Qaeda. Today, the data collection—now known as the Western Jihadism Project (WJP)—has become a unique multi- media archive of quantitative and qualitative data recording the growth of Islamic extremism in Western states since the early 1990s. Lack of individual-level data has for years hampered the development of evidence-based theories that might explain the growth of terrorist Islamist militancy in Western states. Secretive, conspiratorial terrorist organizations pose special challenges for researchers for practical and legal reasons. Klausen’s data collection was developed to address these problems and to support the analysis of Western Islamic extremists’ cross-national and personal social networks and the demographics of who becomes a terrorist. In addition to the pedagogical component of teaching our students the latest digital technologies, the collaboration allows us to study, document, and preserve the world’s cultural heritage. Early results have been quite promising with available tools at hand, resulting in the 3D scanning and printing of a Neo-Assyrian plaster relief and various objects in the Classical Artifact Research Collection (CLARC). Students are now attempting to conduct cutting-edge research, including the digital reconstruction of artifacts based on scans of sherds with the hopes of 3D printing whole vessels. With material culture under more danger than perhaps ever in history, this collaboration hopes to leverage the latest tools to bring awareness to this plight and document artifacts in a manner impossible just a few short years ago. The concept of “successful aging” has dominated academic discourse in gerontology since the 1980s, but to date little work has investigated the ways older people themselves envision and strive to practice aging well. This project asks how actors differently situated—by their economic circumstances, social-cultural environments, family situations, religious sensibilities, and health conditions—encounter and practice the aspirations of successful aging circulating in our society and spreading in various instantiations around the globe. My preliminary data from the US and India suggests that successful aging—despite its inspirational vision—can be experienced as profoundly ageist, growing out of a deep cultural discomfort with what could (or should?) be regarded as the normal human conditions of frailty, (inter)dependence, vulnerability, and transience. Successful aging discourse also tends to overlook social inequalities—but to understand how and in what ways, we need fieldwork with low-income elders. Andrea Amati (1505-1577), who lived in Cremona, made the world’s first violin. 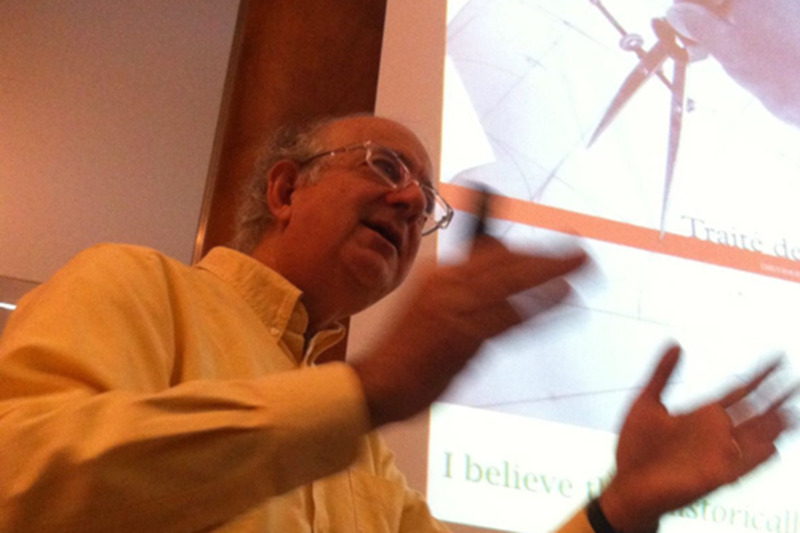 In homage to him, the “Digital Amati” project seeks to advance our understanding of fundamental geometric structures in the design of classical string instruments. Like classical architecture, the design of these instruments is founded on geometric principles. We can bring to light computational aspects of that artistic history, using a new programming language vernacular that describes traditional seventeenth-century methods of design. Notions of measure and accuracy changed from the geometrically Euclidean to the numerically Cartesian, and in that transition, the original design rules of lutherie became obscured. Recent research has recovered some of that lost knowledge. Digital technology and software methods provide tools for facilitating and enhancing the understanding inherent in that geometric tradition, facilitating rapid experimentation and communication. Algorithms encode methods, including those that are ubiquitous in lutherie. Programming languages don’t exist simply to tell machines what to do. Well recognized as the engineering vernacular of software, they are more importantly the collective mother tongue of algorithmic ideas. Computational thinking is an accepted way of understanding complex, constructional processes; programming languages—a form of writing—provide a medium for us to express to each other what we know how to do. I am seeking funding is to build a string instrument compiler. The purpose of this study is to use national data to examine types, frequency, and characteristics of violence victimization against men and women who are deaf and hard of hearing (DHH). Hearing loss is the United States’ second most common disability, affecting ~17% of Americans (an estimated 36 million people). The adverse effects of hearing loss are well recognized. These include isolation, lower income, poorer cognitive function, poorer physical health, reduced life quality, depression, and impaired social interaction. We will conduct descriptive and bivariate statistical analyses, and multivariate modeling to document the rates, types and patterns of nonfatal violence against DHH and non-DHH men and women. We will also describe and compare the characteristics of DHH and non-DHH survivors of violence, the attributes of the victimization and the perpetrator characteristics. Economic and financial data are sampled at different frequencies. Most financial data series are readily available on a daily or weekly basis, while data on macroeconomic aggregates are sampled less frequently and their publication is subject to significant delays. A prominent example is the Gross Domestic Product (GDP), which is released quarterly and becomes available about a month after the end of the quarter. Mixed or irregularly sampled data constitute a significant challenge for applied macroeconomists. For example, Vector Autoregressive (VAR) models, one of the most widely used tools of macroeconomists to analyze the sources of business cycle fluctuations, assess the effect of monetary or fiscal policy interventions, and forecast the individual time series, cannot be easily adapted to handle mixed frequency data. In lieu, these models are usually estimated on time-aggregated data, sampled at the common lowest frequency. An example of this would be a VAR with both macro and financial time series sampled quarterly, even though the financial series are observed weekly or even daily. Since 2015, I have been closely working with scholars in Taiwan to promote the neglected field of Taiwanese art history, which has hitherto been overshadowed by the greater “Chinese art history.” Building on the momentum of the newly established Taiwan Art History Association (est. March 2016 in Taipei), I, being the first U.S. member, seek to kickstart a series of activities to build expertise in the U.S. and ties with Taiwan. In Fall 2016, I shall be offering a course devoted to Taiwanese ink painting (with a related Hong Kong component) sub-titled “Chinese Renaissance in Exile,” the first ever course on Taiwanese art in this country. I would like to apply for the Provost Research Award to write a book based on my course as well as organize an international conference to be held in Spring 2017. I envision this conference to be a collaboration with members of the Taiwan Art History Association. The major challenge of this new field is the paucity of English-language resources, which my book-in-progress will help rectify, and I would use my fall course and the conference to situate Brandeis as the center of this new research field. To date, only two significant books in English have been published on Taiwanese art. This year's Inquiry Event featured presentations from the 2016 Provost Research Grant recipients. The event took place in the Shapiro Campus Center Multipurpose Room on Oct. 19, 2017, from 1–4 p.m. Ten speakers shared PowerPoint presentations on the research conducted all over the world in the past year with funds from the Provost. The Brandeis University Provost Research Award was an excellent opportunity for Heller doctoral student, Robbie Dembo. Robbie is a Ph.D. student at Heller and a research assistant in the Lurie Institute of Disability Policy. The Provost Award allowed Robbie to get hands-on experience working with a complex data set and analysis during his first year of graduate school. It enabled him to lead a peer-reviewed publication on psychological consequences of violence victimization against adults with disabilities, The psychological consequences of violence against people with disabilities, as well as present study findings through a webinar organized by the APHA Disability Section and an oral presentation at the 2018 AcademyHealth conference. 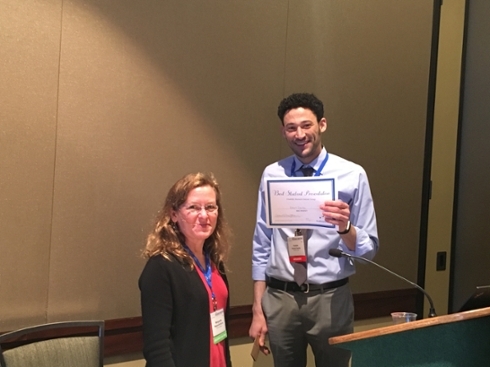 Robbie won the 2018 AcademyHealth Disability Research Interest Group Best Student Award for his presentation.